The internet impacts heavily upon the way that we live, study and work. But it hasn't always been that way. In the 1960s ARPA, a part of the American Department of Defence, funded several large computing projects. These projects were very expensive and situated in different parts of the USA. It was unreasonable to expect research groups to travel to each of these sites, and it was far too expensive to build more of them, what was needed was a method to link them together so that information could be easily exchanged. 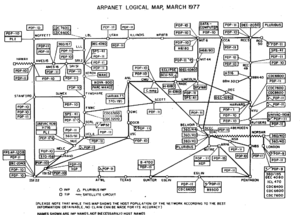 ARPANET was created, basing communication on packet switching. This system of communication broke messages into chunks which were then passed to other sites using a network of interlinked computers. Due to the unreliable nature of connections, if any link in the network broke, a packet could be re-routed around the problem to reach its destination. The concept is similar to how drivers can take different routes when they meet a blocked off road. A popular myth is that the internet was started because the American Department of Defense were looking at how they could maintain control of military installations in the event that they were on the receiving end of a Soviet Nuclear strike. This would mean that communications between sites would have to be maintained even if one or more of the sites connecting installations were knocked out. A sound idea, but not the reason for starting ARPANET. The network never carried any classified material and was predominantly used for research purposes, connecting research institutions, including Universities in the UK. In the 70s ARPA funded other experimental networks and made an effort to unite them. At the same time the limits of the initial network to 63 nodes and 252 hosts were reached and so the TCP/IP protocol was created. This protocol, or set of rules, allowed different networks to talk to each other. This protocol still forms the main link between networks in the internet to this day. As the internet consists of many different networks interlinking with each other, the internet has no central structure or governing body. This makes it very robust, meaning that if one connection between two hosts is lost, you can probably find another route to send information by. It also poses a threat to some governments, as they struggle to restrict information available to their citizens. Countries such as North Korea and China filter their internet links through a few connections to the outside world, this means the government can control what comes in and out of the country, giving them the ability to filter which websites are available and allow them to switch the internet 'off' at times of crisis, by cutting these connections. This happened during the 2011 Arab Spring, where Tunisia, Egypt and Libya tried to stop their citizens from getting information from the outside world. The first thing to notice is that the World Wide Web is not the internet, but a subset of what the internet offers. 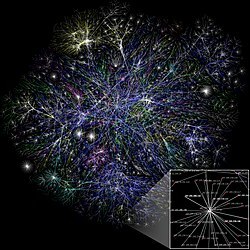 The internet hosts all forms of data, including games, video, telecommunications etc. while the WWW only transmits hypertext documents. The WWW is accessed through a web browser linking files together using hyperlinks and was invented by a British computer scientist, Sir Tim Berners-Lee in 1989.